Although the komodo is a fierce predator, they do not generally kill their prey on attack. 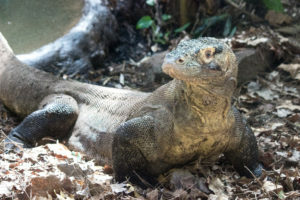 The Komodo dragon has virulent strains of bacteria in its salvia and prey usually dies from blood poisoning a few hours or days after being bitten. Adult Komodos can consume as much as 80% of its body weight in one sitting. They are very patient predators and lie motionless watching for prey to near. Komodos can run quite fast for short distances, reaching speeds of about 11 miles per hour, and they are also very good swimmers. When the prey is close enough the komodo uses its speed to lunge quickly at the prey and uses its strong jaws to bite the victim. They do not have good hearing but their eyesight and very keen sense of smell make-up for that. In fact, they are able to smell carrion from great distances. This allows them to find prey that was wounded in an attack and later dies.